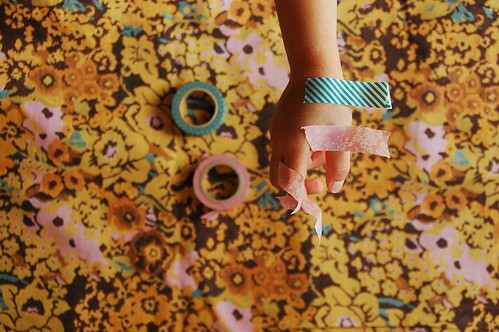 Our version of a paper chain. True and I did this together one afternoon while her little sisters were napping. 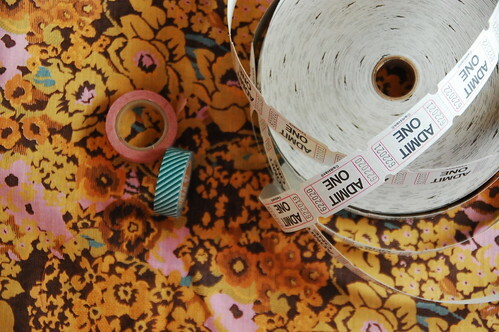 All you need is: a roll of tickets, happy tape (glue would work too), and happy workers. 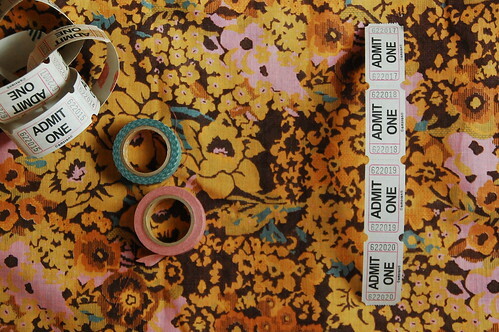 If have tickets in other colors, add those in as well! 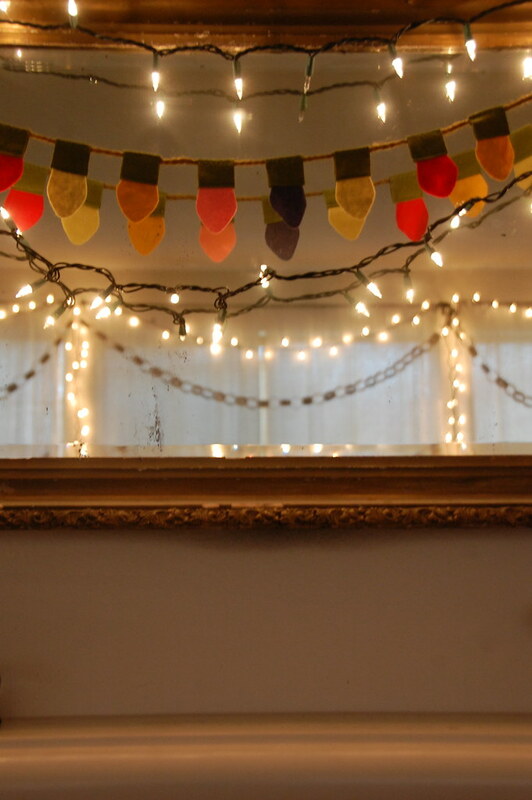 After your chain is finished, go decorating happy! Hmm... maybe we should have a carnival-esque themed Christmas?! Just a thought. Well, we still have no tree, but hey, we got a ticket chain up (and our stockings)! Hopefully, this weekend everyone will be well enough and we can work on our Christmas tree! Thank you for all the get well wishes. They all have been resting all day long for days now. I also have introduced them to She-ra and Jem. Ha! Those bring back good memories of when I was younger, so I thought they might like to watch it. They have taken to She-ra, but they don't really like Jem, so I only put Jem on when they finally fall asleep and I am folding laundry. I loved Jem so much! So with all the resting (and She-ra watching), Brave is very slowly recovering, and thankfully the two other girls don't seem to be as bad as Brave was. Hopefully, it is a milder form of Brave's and maybe, just maybe, the sickies will skip over Ben and me! Can you believe Christmas will be here in about a week?!! Do you still have lots to do before next Saturday? My main project right now (when the girls nap) is getting all the messes in my house put away! oh so inspiring! love this. and yes totally go for the carnival theme one year. love it! we haven't gotten our christmas tree yet either! We just got our tree up today! And there is tone of work to be done arround the house and some presents still boutght! Hope your family will be all nice and healthy in no time! 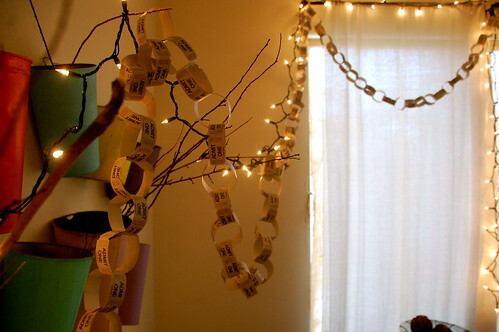 I made an enormous paper chain this year from paper scraps from my office: unmitigated joy. I had a Jem doll with a light up necklace and earrings. Thank you for making the season a little brighter with that memory. Love your ticket chain! There a few weeks my husband and my two kids were very sick. But me not, so I could juste take care of them. Maybe it will be your case. 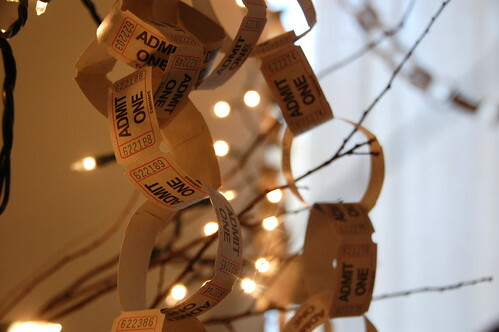 I love the ticket stub garland! I saw some little lonely Christmas trees for sale yesterday... I wish I lived near so I could bring one over! I wanted to tell you that Caroline is "oohing and aahing" over the book... she absolutely loves it and has announced that we should move to California!!! Fine by me! 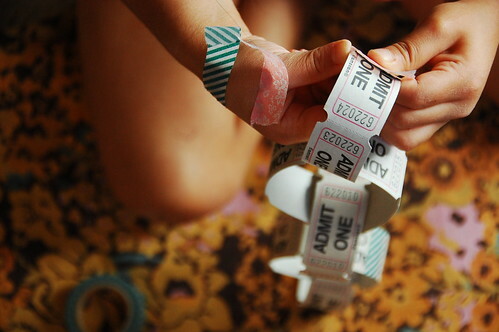 Love the ticket chain! Such a clever idea!!! I really hope that the sickies will skip you guys - terrible to be sick when you should be putting up a tree and celebrating christmas! 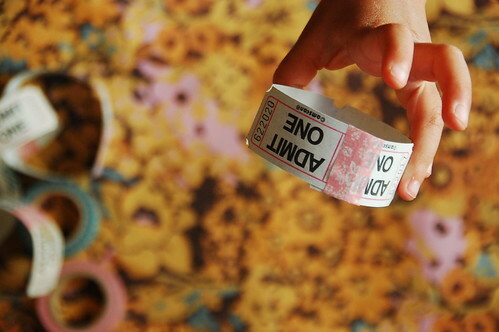 I love your ticket chain, the pics are wonderful. Hope all continue to get well and you are able to get your tree! Merry, merry Christmas! So fun!! 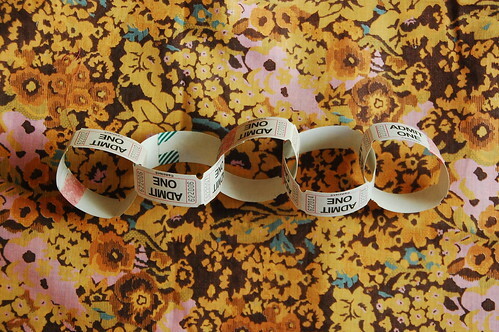 We went a little crazy making paper chains and snowflakes this year. Love the look! I really like your felt lights, and that fancy tape is so great!